Dr. Debby Hamilton will be seeing patients at the Neuroimmune Center in Denver once a month and will be doing tele-health consults. Please call (303) 224-4711 for appointments and ask for Courtney or contact czwirko@immunoe.com. Please return for an updated website with more information including webinars on chronic conditions in children beginning with a webinar on inflammation on January 17th at 10 am MST. Inflammation is one of the causes of chronic disease but what does that mean and what can we do about it to get our children better. This will be a parent focused presentation on inflammation including a discussion of neuroinflammation in autism and depression with information on natural treatments. It will be the first of a series about what happens at a cellular level in chronic disease in kids. 1 in 42 boys have autism. 1 in 9 children have ADHD. Dr. Hamilton is dedicated to reducing the chances of having children with these diseases. She is helping women have healthier children – starting before pregnancy. 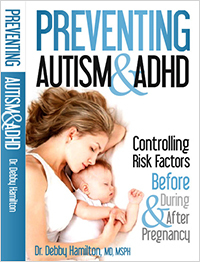 CLICK HERE for more information on Dr. Debby Hamilton's book "Preventing Autism & ADHD: Controlling Risk Factors Before, During & After Pregnancy". 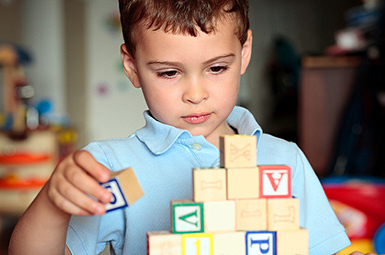 This new child health charity is focused on research to prevent diseases like autism & ADHD. Dr. Hamilton is a member of the NHF Scientific Panel. Improve your nutrition through eating whole and organic foods. Ensure you digestion system is functioning properly for absorption and waste elimination. Get tested for proper levels of key vitamins and minerals – supplement when needed. Take a prenatal vitamin before pregnancy – yes, before pregnancy. Get tested for toxins like lead and mercury and remove them (but only before pregnancy). Remove mercury (amalgam) fillings (only before pregnancy). Ensure hormones are at proper levels. Exercise before and during pregnancy. Plan to manage the physical and psychological stress of pregnancy by planning to reduce work, get help, and creating a peaceful environment. Create a healthier home and work environment by reducing exposure to plastics, pesticides, and other chemicals. 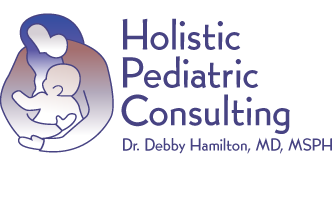 Dr. Debby helps to improve the quality of your life and that of your child with a biomedical approach. She also works with women preparing for pregnancy and expectant mothers to reduce their chances of having a child with autism or other chronic diseases. Dr. Hamilton is a medical doctor with a Masters of Science in Public Health degree. She treats hundreds of children with autism and ADHD. She is triple board-certified in pediatrics, integrative medicine and physician nutrition. She attends events to speak about reversing the increasingly common childhood diseases like autism and ADHD.